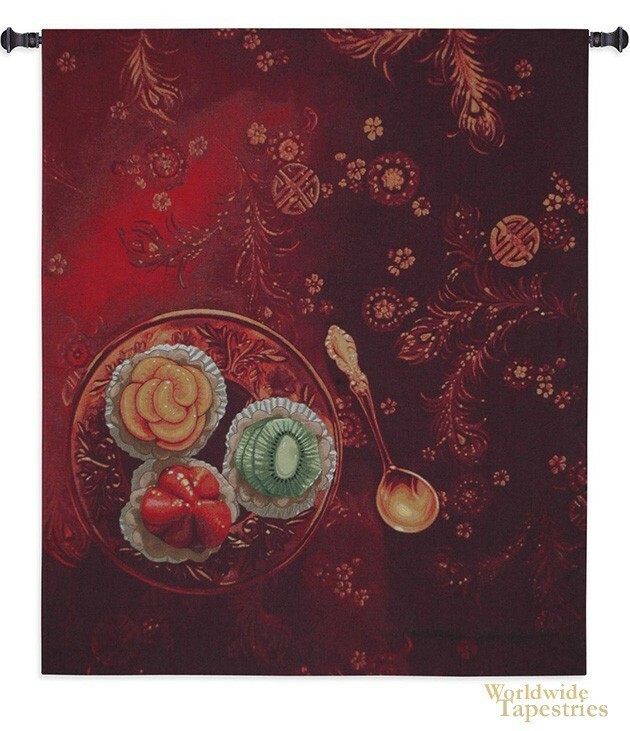 Golden Spoon tapestry shows a sumptuous scene of desserts and a golden spoon. Here we see a work which shows a lovely collection of desserts of strawberry, kiwifruit, and peach tarts, on a red plate, surrounded by a decadent red tablecloth, with a golden spoon. The work is colorful and richly saturated to provide color and decoration to any room. Golden Spoon tapestry is backed with lining and tunnel for easy hanging. Note: tapestry rod and tassels, where pictured, are not included in the price. Dimensions: W 40" x H 50"